Needlebush ( Hakea sericea, PROTEACEAE ). 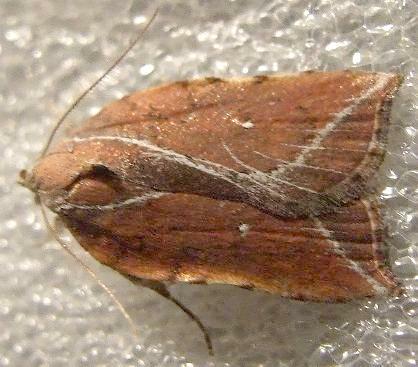 The adult moth of this species has rusty brown forewings each with a white dot in the middle, and a thin gray diagonal stripe across the margin. The hindwings are pale brown shading darker at the margins. The wingspan is about 3 cms. CSIRO Publishing, Melbourne 1994, pp. 33, 34, 195-200. Volume 7, Part 4 (1883), pp. 427, 433-434. Volume 70, Parts 3-4 (1946) p. 104.